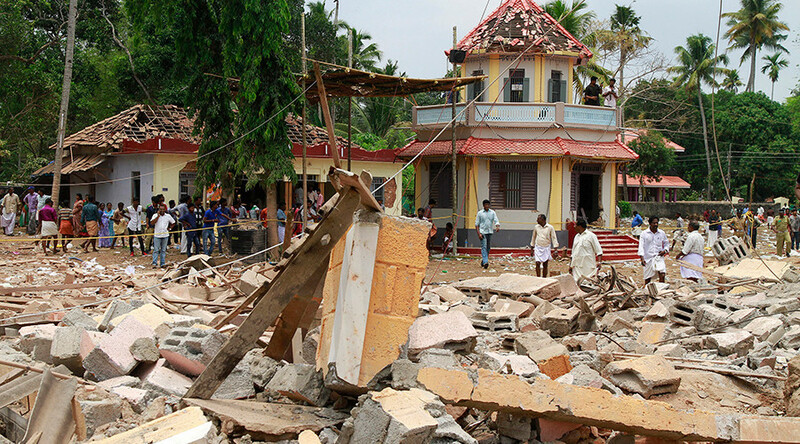 At least 102 people have died and more than 200 were injured after celebratory firecrackers reportedly caused a massive blast and fire at a Hindu temple located in a coastal town near Kollam in the southern Indian state of Kerala. #KollamTempleFire Kerala DGP TP Senkumar tells @IndianExpress that 84 people died and many more injured, "V have launched a probe," he said. — Arun Janardhanan (@arunjei) 10 апреля 2016 г. — Julien (@julienboulot) 10 апреля 2016 г. The fire broke out at Puttingal Temple in the town of Paravur early on Sunday, India Today said, reporting that the building has been completely destroyed. Police have confirmed the death toll to local media. Local TV channels blamed the accident on firecrackers used in temple celebrations, according to Indian Express. It has been reported that one of the firecrackers sparked a cache of pyrotechnics, which caused a massive explosion, the Times of India says. The high number of casualties was due to the collapse of the temple building, the Indian Express reports. “A lot of people were hit by debris from the building,” an eyewitness told Manorama News. Fire at temple in Kollam is heart-rending & shocking beyond words. My thoughts are with families of the deceased & prayers with the injured. — Narendra Modi (@narendramodi) 10 апреля 2016 г. Windows within a one-meter radius of the sanctuary were reportedly shattered by the explosion in the temple’s storage room. Multiple victims have been admitted to hospitals in Meeyapuram and Kottiyam areas with burns, while those severely injured are being treated at the government medical college. Overall, more than 200 people suffered from burns. Facebook has activated its Safety Check feature in response to the deadly explosion in Kerala. FB users near the site of the fire can inform their family and friends that they are safe. The tragedy occurred just a few days before the Vishu festival in Kerala on April 14, which marks the Indian New Year and is celebrated on various dates across the country. The present incident was preceded by complaints from local residents about the annually fireworks contest at the temple. The competition had been scrapped by the temple authorities, who assured the local administration that this year’s celebrations would be purely ceremonial, the Indian Express reports. The celebration, widely known as the festival of light and fireworks, traditionally sees an abundance of pyrotechnics displays. Police, however, say the temple had been warned against setting of fireworks before, and the site had no permit to do so. — Hindustan Times (@htTweets) 10 апреля 2016 г. “The temple holds an annual firework display every year. We’re doing our best to rescue those still trapped,” said Kerala Home Minister Ramesh Chennithala, as cited by the Indian Express. According to her, a probe will be launched into the circumstances behind the fire. Puttingal Temple, which is one of the oldest in the area, is devoted to the Puttungal Goddess. Its annual festival attracts large crowds of locals and foreigners.